10 www.coalage.com July/August 2018 news continued In a sustainability report it released in early July, Vectren said moving mostly away from coal will enable it to reduce carbon di- oxide emissions by 60% by 2024. As might be expected, the upcoming change in Vectren's gen- eration fleet will sharply decrease the amount of regionally pro- duced steam coal that currently fuels its power plants. The rough- ly 4 million tons of coal the utility now buys annually could be cut to a million tons or less a year. In particular, that could have a significant impact on Hallador Energy's Sunrise Coal subsidiary that currently supplies most of that coal from its Oaktown Nos. 1 and 2 underground mines in Knox County, Indiana, and Ace in the Hole surface mine in Clay County, Indiana. Vectren is the last of the state's major electric utilities to push ahead with coal plant retirements. Indiana Michigan Power, an American Electric Power subsidiary, was among the first when it closed its 995-MW Tanners Creek plant in Lawrenceburg nearly five years ago. Since then, Duke Energy Indiana, the state's largest electric utility with more than 800,000 customers, closed its 665-MW Wa- bash River coal plant near Terre Haute. IP&L, an AES Corp. sub- sidiary, retired its Harding Street and Eagle Valley coal plants two years ago, leaving it with only one remaining coal plant — 1,700- MW Petersburg in Pike County. Earlier this year, Northern Indiana Public Service Co. shut down its 480-MW Bailly plant near Chesterton, and intends to padlock about 700 MW at its 1,780-MW R.M. Schahfer coal plant near Wheatfield in 2023. Hoosier Energy, a Bloomington-based generation and transmission co-op, said it has no plans to retire its only coal plant, the 1,100-MW Merom station in Sullivan County. Although it is adding more renewables, Indianapolis-based Wabash Valley Power Association, another G&T, still gets 41% of its power from coal, mainly through its co-ownership in a unit at Duke Energy Indiana's 3,145-MW Gibson Generation Station near Princeton, one of the largest baseload coal plants in the U.S. FirstEnergy Solutions Trying to End Coal Supply Contract With Murray Energy In June, FirstEnergy Solutions (FES), an unregulated subsidiary of Ohio-based FirstEnergy Corp., asked a federal bankruptcy court for permission to terminate a long-term coal supply contract rep- resenting millions of tons of steam coal with McElroy Coal Co., owned by Murray Energy Corp. of St. Clairsville, Ohio. In the filing in the U.S. Bankruptcy Court for the Northern District of Ohio, FES cited a January 10 fire at its 2,490-megawatt (MW ) Bruce Mansfield power plant at Shippingport, Pennsylva- nia, that resulted in a sharply reduced need for coal. Under a 22-year contract signed in 2006 with McElroy, now known as the Marshall County mine since it was acquired by Murray from CONSOL Energy several years ago, FES is obligated to purchase 6.5 million tons of coal annually through 2028 from the West Virginia underground operation. The "subsequent unavailability" of Bruce Mansfield Units 1 and 2 because of the fire means FES needs only 2.5 million tons of coal in 2018 and expects to require only 3.6 million tons in 2019 to op- erate both Bruce Mansfield and the 2,233-MW W.H. Sammis plant along the Ohio River near Stratton, Ohio, according to the filing. "There is currently a 110-day supply of coal at the Mansfield plant based on typical operating consumption," FES said. 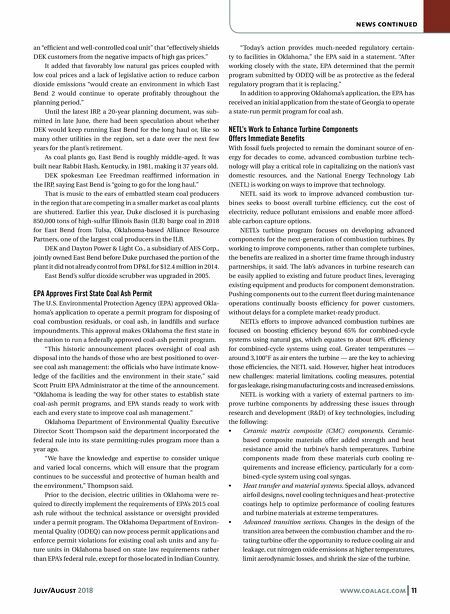 "Thus, the minimum volume of coal that [FES] is required to purchase under the coal sales agreement significantly exceeds [FES's] pro- jected needs." FES is asking the court to make the contract termination retroactive to March 31 when it filed for Chapter 11 bankruptcy re- organization. As of July 11, the court had not ruled on the request. Since its bankruptcy filing, FES said it has negotiated with the coal company "but the parties have been unable to come to an agreement to amend the coal sales agreement satisfactory to both parties." FES said it would save about $20 million in 2018 and $14.5 mil- lion in 2019 if the court would approve the contract termination. FirstEnergy and Murray Energy, the largest privately owned coal company in the U.S., have declined to comment publicly on the filing. Duke's East Bend Coal Plant in Kentucky in it for 'Long Haul' A 600-megawatt (MW ) coal-burning power plant owned and operated by Duke Energy Kentucky (DEK) along the Ohio River in Boone County, Kentucky, is expected to remain open for the next two decades, at least, under a recent integrated resource plan (IRP) filed by the utility with the Kentucky Public Service Commission. DEK, a subsidiary of Charlotte, North Carolina-based Duke Energy Corp., told Kentucky regulators its East Bend No. 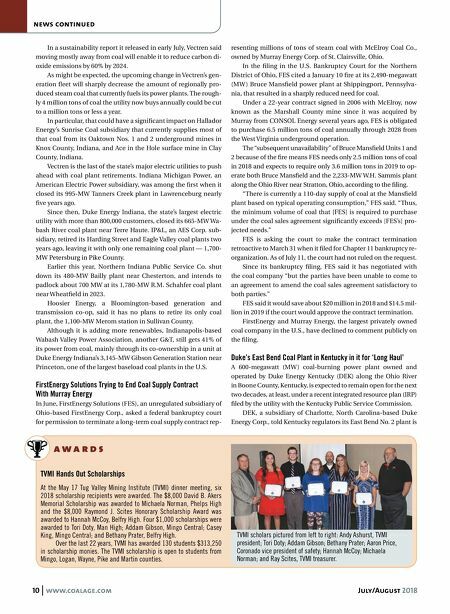 2 plant is TVMI Hands Out Scholarships At the May 17 Tug Valley Mining Institute (TVMI) dinner meeting, six 2018 scholarship recipients were awarded. The $8,000 David B. Akers Memorial Scholarship was awarded to Michaela Norman, Phelps High and the $8,000 Raymond J. Scites Honorary Scholarship Award was awarded to Hannah McCoy, Belfry High. Four $1,000 scholarships were awarded to Tori Doty, Man High; Addam Gibson, Mingo Central; Casey King, Mingo Central; and Bethany Prater, Belfry High. Over the last 22 years, TVMI has awarded 130 students $313,250 in scholarship monies. The TVMI scholarship is open to students from Mingo, Logan, Wayne, Pike and Martin counties. % a w a r d s TVMI scholars pictured from left to right: Andy Ashurst, TVMI president; Tori Doty; Addam Gibson; Bethany Prater; Aaron Price, Coronado vice president of safety; Hannah McCoy; Michaela Norman; and Ray Scites, TVMI treasurer.